The Mark 2 combat/utility knife came in to service with US servicemen in 1943 and has been used in every conflict since and is still in use today. This knife was made by several manufacturers. But for some reason the name KaBar (trade name of Union Cutlery Co.) has become synonomous with this design. 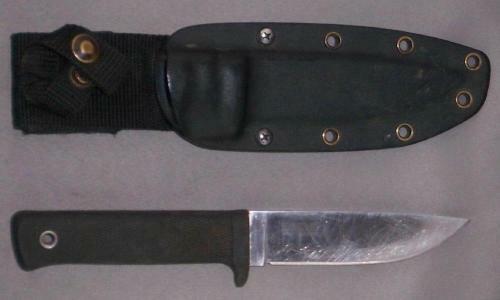 The Mark 2 combat/utility knife was used by Australian soldiers in Vietnam. I am uncertain as to whether these knives were private purchase or an issue item. This Cold Steel Master Hunter was carried by an Australian Soldier during two deployments to East Timor in 2000 and 2002. This was a private purchase intended to fill the need for a decent utility knife. A requirement apparently not shared with current military planners. This knife has an AUS 8A Stainless Steel blade a Kraton handle and a Concealex sheath. There are no military markings. The Jet Pilot Survial Knife made by both Camillus and Ontario have been issued to the Australian Military Forces. 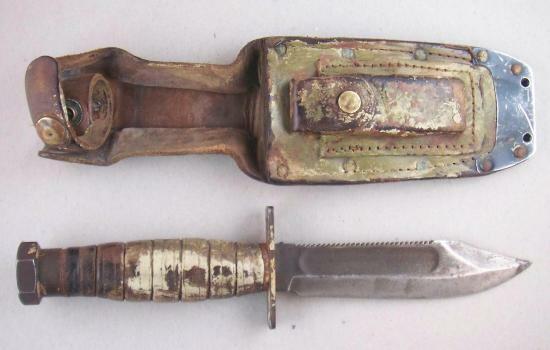 Although originally developed by the US as a survival knife for air crew, these knives have been eagerly odopted by other services. Many a soldier has carried one while on operations. These knives were issued to Royal Australian Air Force (RAAF) air crews up until 2005. Currently, the RAAF issues the British Type "D" Survival knife to F-18 fighrter pilots. I am unaware of a knife that is genearal issue to all air crew. These knives have also been issued to Army units including members of the SASR. There are no military markings stamped or engraved on the knives. 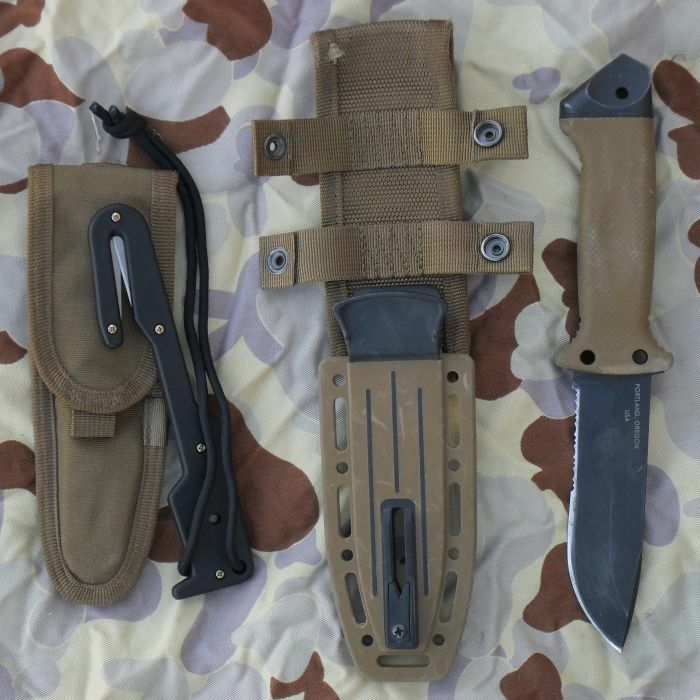 Sheaths have been noted with the NSN 7340-00-098-4327 and the description "Knife, Hunting, Sheathed, Survival, Pilot". I have no information on the scale of issue. This knife is in use by Special Operations Task Group (SOTG) soldiers currently deployed to Afghanistan. These knives are issued with the Kydex sheath that has a groove to enable cord to be cut without having to unsheath the knife. These knives are marked SOG on the blade and SOG Speciality Knives on the handle. There are no military markings stamped or engraved on the knives. The Kydex sheath is also marked SOG Specialty Knives. This knife is not on issue to the ADF. I am aware of these knives being carried on deployment by Australian Soldiers as Private Purchase items. This knife was owned by an Australian Serviceman who took the knife on deployment to Afghanistan. These knives would have been Private Purchase items. 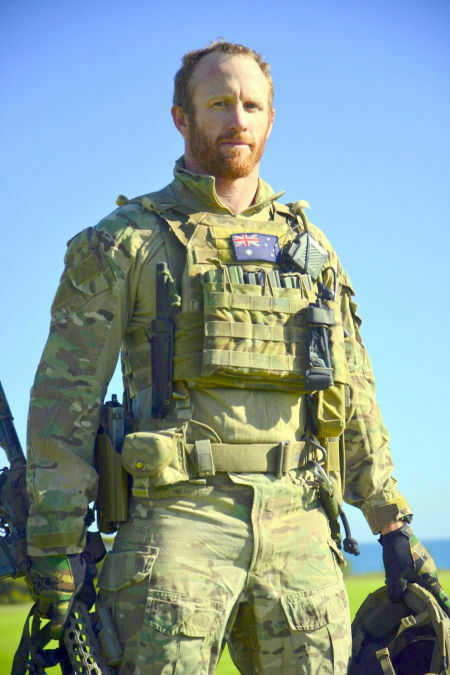 This photo of Cpl Mark Donaldson VC clearly shows a Kobun on his chest rig.